For the first time, several Pittsburgh-area school districts are implementing school-wide asthma screenings for students, with help from Duquesne University and the Pediatric Alliance. The Clairton, Northgate and Woodland Hills school districts and Propel-Hazelwood charter school are implementing the screenings this month as part of their back-to-school process. Parents will complete a four-question survey to help identify whether their child has asthma and if so, if it is controlled by medication. Associate Pharmacy Professor Dr. Jennifer Elliott and Pediatric Alliance physician Dr. Deborah Gentile are spearheading the effort. They previously conducted asthma screenings on more than 1,000 children in the region as part of a research project to determine asthma prevalence and control, and how environmental factors contribute to these outcomes. With funding from the Breathe Project of the Heinz Endowments and the Jefferson Regional Foundation, the current screening program is being offered as a public service to interested schools. "School-aged children in the Pittsburgh region have a much higher occurrence of asthma than children in other areas of the country," said Gentile, adjunct pharmacy professor at Duquesne and asthma specialist at the Pediatric Alliance. "The screenings will allow us to identify if a child has asthma, (determine) if it is controlled, and treat it appropriately." The previous study conducted by Elliott and Gentile was based at Allegheny Health Network. It found that of more than 1,200 western Pennsylvania school children, 24 percent suffered from asthma, as compared to the national average of 8.3 percent as reported by the National Center for Health Statistics. The study also found that some groups of children, specifically African-American children and those on public insurance, had a significantly higher prevalence of the disease. Studies have shown that air pollution, among other triggers, can worsen asthma symptoms, and both Pittsburgh and Pennsylvania scored poorly on the American Lung Association's 2018 State of the Air report. Pittsburgh, Lancaster, Philadelphia and Johnstown-Somerset were all Pennsylvania regions listed in the report's top 25 for most polluted areas by "year-round particulate pollution." 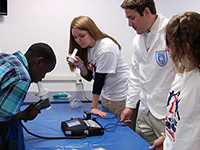 The screenings mark the beginning of a larger push to make asthma screenings available for all schools in the Pittsburgh region and eventually Pennsylvania, said Elliott, associate pharmacy professor at Duquesne. "Asthma is one of the top causes of missed school days, which can have a negative impact on a child's ability to learn, be active and develop healthy peer relationships," Elliott said. "In past studies, we've found that approximately 15 percent of parents may not even know that their children have asthma. School-based screenings can help ensure children with asthma receive the treatment they need earlier to live healthier lives."